Enforced sacrifice, punishment, loss, fatal or voluntary, suffering, defeat, failure, death. Mem is the pronunciation, meaning Water, and it is given also the element of Water. In its shape, some authorities perceive the waves of the sea. Its gods are Tum Ptah Auromoth, combining the idea of the God of the Setting Sun, the King of the Gods, and a purely elemental divinity. Poseidon and Neptune are again attributed as representing water and the seas. Mem is called "The Stable Intelligence", and its colour is Sea Green. The Cup and Sacramental Wine (Soma, the elixir of immortality) is the magical equipment for ceremonial. 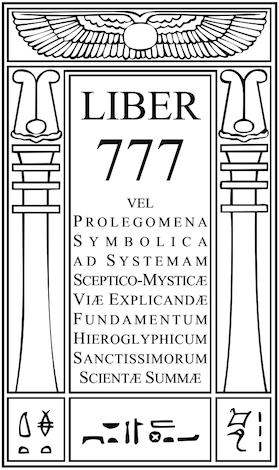 The so-called Kerubs of Water are the Eagle, Snake, and Scorpion, representing the unredeemed man, his magical force, and his final salvation. 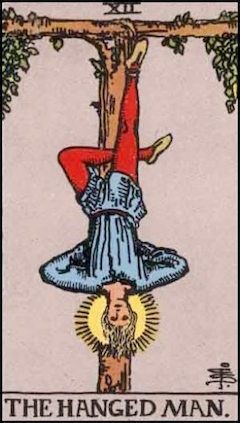 The Tarot attribution is XII -The Hanged Man, a most curious card, representing a man, in a blue tunic, hung head downwards (surrounded by a golden halo) from a T-shaped gibbet by one foot, the other being bent behind the knee suggesting a cross. His arms are tied behind his back forming a triangle, base downwards. It is the formula of the "Saviour", bringing light to the men of earth. All water plants and the Lotus are proper correspondences. Aquamarine or Beryl is its precious stone, and Onycha and Myrrh its perfumes. The Hanged Man — [Cups] Queens. The Great Work, Talismans, Crystal-gazing, & c.
The Queen of the Thrones of Flame. 20° l to 20° a, including part of Andromeda. The Spirit of the Mighty Waters. Nymphs and Undines, Nereids, &c.